Get up to $650 from Sprint when you switch from your current carrier. Click link to learn more. Sprint Buyback gives you up to $350 in account credit when you trade in your eligible old phone or tablet. Click link to get started. Bring Sprint your Verizon or AT&T bill and they'll cut your rate in half! Click now for this limited time offer! Get a $75 service credit when you lease a smartphone online and bring your number to Sprint. Click link to start saving. Save $149.99 instantly on the iPhone 5s! Click link to shop Sprint.com now! Get four lines of unlimited talk, text and high-speed data for only $37.50 per line. Click link to learn more. Sprint offers truly unlimited talk, text, and data for just $75 a month. Click link to get started. For a limited time get a 1GB Tablet Plan for just $15 per month. Click link to view details at Sprint.com. Say hello to affordable plans with no annual contract from Sprint. Click now to shop plans starting at just $35. 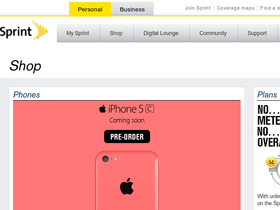 Visit Sprint.com to find mobile phones, plans, tablets and devices. Get incredible deals when you use Sprint coupon codes from Coupon Gurus to shop the most popular phone brands including iPhone, Samsung, LG, HTC, Blackberry, Motorola, and more. They also carry a great selection of accessories for your device. You'll find a variety of plans to suit your needs, from individual unlimited plans to family plans with plenty of data for everyone. Sprint also offers prepaid plans. Be sure to visit Coupon-Gurus.com before you buy for the biggest Sprint discounts with the best Sprint promo codes and Sprint coupons on the web! Use this coupon code to get free shipping on all orders over $20 from CellPhoneShop.net. Click to shop, ship, and save today. Use this promo link to find deals on calls to China for only 1 cent per minute. Use ComFi phonecard services to save up to 95% on your long distance bill. Click link to view rates and save. Check out ComFi and call Ireland from the US for only 5 cents a minute. Click link for details. With ComFi phonecards you can call over 100 countries at the lowest prices. Click link for details. With ComFi and this promo link sign up for a phonecard for free. Click link for details. Sign up for a new plan with select carriers and receive a free phone! Click link to see the selection. Wirefly.com is now offering a free 4GB memory card with your phone purchase. Click link to take advantage and use code at checkout.